Heading a modern soccer ball can carry as much force as a tackle by an American football player, according to a study by Purdue University in Indiana. 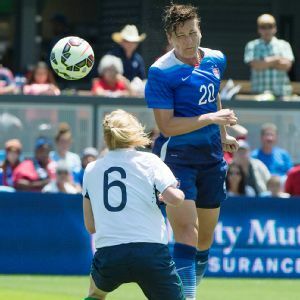 The study, which focused on women's soccer, tested two high school teams and one collegiate-level squad during an entire season, monitoring the G-force impact of heading a ball through sensors and MRI scans which then tracked the changes in a player's brain. A university study examined the risks involved in heading a soccer ball. Eric Nauman, the director of the Human Injury Research and Regenerative Technologies Laboratory at Purdue University, told The Guardian that the force of heading a goal kick came in between 50g and 100g. "The percentages of 100g hits was effectively the same between women's college soccer and American football, which really surprised us," he said. "And while American football players tend to take more hits overall in a given practice session and game, the college soccer players were getting hit every day and so it evened out." West Brom legend Jeff Astle died in 2002 at the age of 59 with a coroner's inquest revealing that the striker's premature death was caused by heading heavy, often rain-soaked, leather soccer balls during his career in the '60s and '70s. And the result of the MRI scans on the players in the study -- which has recently been published in the Journal of Biomechanics -- show that brain injury is a concern, despite the relative lightness of the modern ball. "We looked at how the blood vessels responded to these headers, and the players who were in the top half for hits taken you could see their vasculature was damaged," Nauman said. "These are things that can heal, but they need rest." "You can bruise any other part of your body and it feels sore. But when the same thing happens to your brain it doesn't have the pain receptors to tell you to ease off for a few days. That is enough to really cause problems." According to the study, some of the college soccer players tested had brain injuries as bad as the American football players' injuries looked at by the Purdue group. And while Nauman insisted that men's necks are physically stronger (which means they can absorb extra force), he is sure that Premier League players are also suffering similar problems. "I'm willing to bet that if a Premier League keeper kicks it out and a player heads it back, they could be pushing 150g or 160gs," he added. "After all, our study on women's soccer players altered our preconceptions. And with soccer it's clear we're only scratching the surface."